NEW ORLEANS – Unlike last week there was so little movement in Week Two of the NCAA Division II Cross Country Regional Rankings released by the U.S. Track & Field and Cross Country Coaches Association (USTFCCCA) on Tuesday that if the association just released the previous week’s poll few would even notice a difference. With large, competitive Division II fields expected at the Roy Griak Invitational, the Paul Short Invitational and the Greater Louisville Classic among others, expect a lot to change after a big weekend in cross country. Until then there was little change to the regional rankings leading up to the big weekend. In total just five programs out of the 45 top-five teams in each of the eight regions on the men’s rankings had any movement while just two top-five teams on the women’s side had any changes. The South and Southeast Regions were the only ones on the men’s side to experience movement while just the West Region had any change to it on the women’s side. The Atlantic Region started the trend of no movement this week as the top-five of both the men’s and women’s rankings remained the same. For the men, Edinboro was named the No. 1 team and was followed by No. 2 Shippensburg, No. 3 Charleston, No. 4 East Stroudsburg and No. 5 Lock Haven. Edinboro was also in the top spot on the women’s side of things as well. Slotting behind them was No. 2 Shippensburg, No. 3 West Chester, No. 4 Kutztown and No. 5 East Stroudsburg. Like the Atlantic, the Central Region also saw zero change in its top-five from the previous week. The Augustana men remained at No. 1 with Oklahoma Baptist taking No. 2 and Sioux Falls slotting in at the No. 3 spot. No. 4 Minnesota State and No. 5 Neb.-Kearney rounded out the top-five. The women’s side remained the same with U-Mary staying at No. 1. They were followed by No. 2 Augustana, No. 3 Oklahoma Baptist, No. 4 Pittsburg State and No. 5 Southwest Baptist. The East Region will stick with the boring trend of no movement as the top-five teams on the men’s and women’s side also remained the same. The men were led by No. 1 American International, No. 2 Stonehill, No. 3 Southern New Hampshire, No. 4 Roberts Wesleyan and No. 5 Southern Connecticut. Stonehill remained atop the women’s rankings at No. 1 with the top-five getting rounded out by No. 2 Roberts Wesleyan, No. 3 Merrimack, No. 4 Assumption and No. 5 Southern New Hampshire. You guessed it right. There was no change to the top teams in the Midwest Region. Grand Valley State took the top spot in each ranking with their men getting followed by No. 2 Southern Indiana, No. 3 Saginaw Valley, No. 4 Walsh and No. 5 Malone. On the women’s side the Lakers were trailed by No. 2 Hillsdale, No. 3 Walsh, No. 4 Southern Indiana and No. 5 Michigan Tech. We finally have some movement as there was a shake up on the men’s side of things in the South Region. While No. 1 remained with Lee (Tenn.) a new No. 2 was selected in Embry-Riddle (Fla.) who improved three spots from the previous poll. The rest of the top-five was made up with No. 3 Alabama-Huntsville, No. 4 Florida Southern and No. 5 Tampa. The ranking changes would stop there as the top-five of the women’s side remained the same as the previous week with No. 1 Lee (Tenn.), No. 2 Tampa, No. 3 Embry-Riddle (Fla.), No. 4 Union and No. 5 Alabama-Huntsville. Back to no movement as the top programs in the South Central Region remained the same. The top-five on the men’s side was No. 1 Adams State, No. 2 Colorado Mines, No. 3 Western State, No. 4 CSU-Pueblo and No. 5 Dallas Baptist. Remaining at No. 1 for the women was Adams State who was then followed by No. 2 Western State, No. 3 Colorado Mines, No. 4 Dallas Baptist and No. 5 UC-Colorado Springs. A new program joined the top-five on the men’s side but other than that the Southeast Region also remained the same. The men were led by No.1 Queens (N.C.), No. 2 Mount Olive, No. 3 Augusta and No. 4 Anderson (S.C.). Joining the top-five for the first time this year in No. 5 was Tusculum. The women’s side saw no change as the top-five was No. 1 Queens (N.C.), No. 2 Mount Olive, No. 3 Anderson, No. 4 North Georgia and No. 5 Wingate. 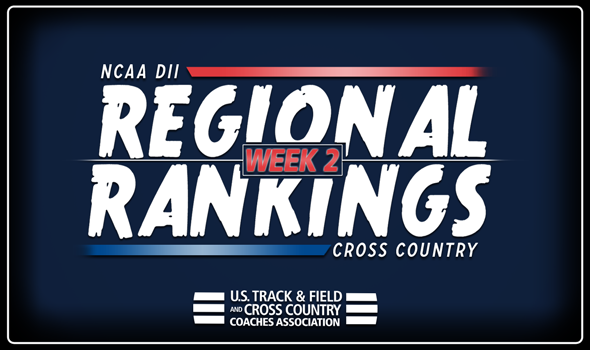 The top-five on the men’s side of the West Region remained the same while two new teams broke into the top of the rankings for the women. The men’s side consisted of No. 1 Chico State, No. 2 Western Oregon, No. 3 Simon Fraser, No. 4 Alaska Anchorage and No. 5 Cal Poly Pomona. While No. 1 Chico State, No. 2 Alaska Anchorage and No. 3 Simon Fraser remained in the top-three they were joined by No. 4 Point Loma and No. 5 Azusa Pacific who each improved one spot from the previous poll.